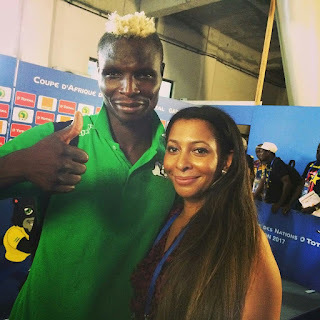 After helping His country, Burkina Faso qualify for African Cup Of Nations 2017 Semi-Finals, Aristed Bance was pictured alongside his friend, Mimi Fawaz. "Always great to catch up with my friend Aristide Bance who helped Burkina Faso through to the semi finals at AFCON. He said whenever I attend an Africa Cup of Nations I bring him luck as he ends up scoring 😂👍 #afcon2017 #burkinafaso #semifinals #gabon"